The Interfaith Center at the University of Vermont has established itself as a space for meaning making. There website states “We all have a need to make meaning of our lives and find answers to the big questions: Who am I? Why am I here? What’s my relationships with that which is beyond me?” Rev. Laura C. Engelken, the coordinator of the Interfaith Center, has put a large emphasis as the Interfaith Center as being a space for dialogue about this meaning making, welcoming people from all walks of life and all religious or areligious backgrounds. The inviting atmosphere she aims at is constructed by the physical design of the space, the people that occupy it, and the sounds, or lack thereof, that those people produce. The Interfaith Center includes three main rooms; the Fireplace Room, the Gathering Hall, and the Prayer and Meditation Room. The Fireplace Room is the first room you come into when you walk into the building on Redstone Campus. The physical nature of this space is set up to look like a living room. Couches line the outside perimeter, with tables and chairs for a “study environment” as Rev. Laura Engelken puts it. Aside from a space to do work, it is also a space for small gathering. The low lying ceilings and fireplace make it feel comforting, a space where dialogue and discussion are very much welcome, but in an informal manner. As Laura puts it, it is a nice place to have a cup of tea and chat really about anything. This room also is shaped by the sounds of coming and going. The front door swinging open and close is a keynote sound in this space. Not only does it emphasis the movement in this room, but it reiterates the nature of the Interfaith Center; welcome to all. This space is very flexible. This noise due to discussion and the movement of feet and doors can be transformed into silence in the matter of minutes. The ebb and flow of silence and noise is distinctly unique to this public institution space. Hillel Schwartz’s “Noise and Silence: The Soundscape and Spirituality” highlights how changes overtime and changes in time determine the nature of a space. He says, “Yes, the soundscape was changing, new sounds were coming to the fore as older sounds faded away. But beneath the changing soundscape the cultural resonances of sound itself were undergoing far more determinative changes” (Schwartz, 6). Here, he is discussing the way that silence and noise have been culturally constructed and appropriated throughout time. In our discussion of Interfaith dialogue, it is important to shed light on the histories that have shaped the way I will discuss noise and silence. Schwartz describes the way that silence has become a commodity the same way that darkness has (Schwartz, 1). Prior to urbanization and industrialization, noise was looked at as the failure of certain tones to cohabit peacefully and intermittent in nature. In the path of urbanization and industrialization, noise has become a constant, a watermark in the background. Today, noise is the “inevitable byproduct of the march of civilization” (Schwartz, 6). Yes, the Interfaith Center has noise due to discussion, worships, machinery, and daily conversations, but, it is also shaped by the intermittence of deep silence. Silence is something that shapes the way the space functions at the Interfaith Center, particularly in the Prayer and Meditation room. Just from the title, you may see how silence could play a key role in the function of the room. I think that the word meditation is often associated with “spirituality” in the broader sense, of course not to delegitimize meditation in Eastern Religions, their origin. Schwartz says “it would be folly to claim that silence was a new religion. I mean rather that, between 1860 and 1930, silence came to seem newly central not to institutional religion or practical theology per se but to spirituality (Schwartz, 8). We see a shift in the way to religiosity is perceived through these times. Much like the seize of ringing church bells in Western societies, we now perceive spirituality as the last resort of a silent world and a silent self. 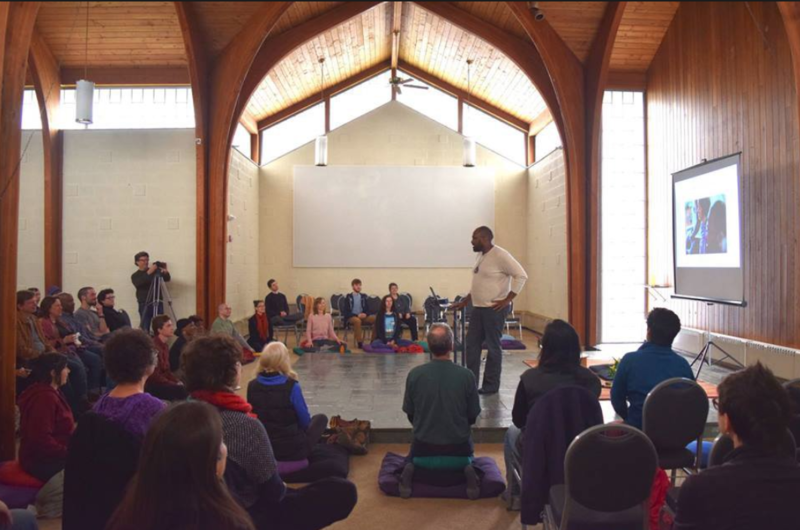 The Interfaith center in the context of religion in Burlington does display an array of faiths, but in the broader context, it reflects the nature of Burlington as a whole as a place of spirituality. The silent nature of the meditation room is shaped by this spirituality that surrounds it and the people that occupy it. The sounds that occupy it reflect how the body plays a major role in sound creation in this space. Deborah Kapchan notes theorists Brian Massumi’s thoughts about what body is in “Keywords in Sound” by expressing, “when I think of my body and ask what it does to deserve that name two things stand out. It moves. It feels” (Kapchan, 34). Kapchan adds that it sounds. Every movement we make is a vibration, and sound is vibration. Therefore, our bodies are constantly making sound, however inaudible to the human ear. Schwartz also acknowledges the power that sound has over the body in terms of how humans perceive their own bodies in space and time (Schwartz, 7). Although this was not sonically highlighted in my ethnography, I would like to note that in the presence of what appears to be silence, there still is this constant buzzing of the human body. The space of the meditation rooms creates an environment to reflect on the movement and nature of peoples bodies, with cushions, rugs and art materials, and also shapes it as a place of solitude and silence. The Gathering Hall challenges the silence and reflective nature of the other spaces at the Interfaith Center. Although it is a space of great flexibility, it has shown to be the space which is the most inviting for sounds and the most acoustically inept. Rev. Laura Engelken expressed how this space physically holds the most people and the most events. Therefore, it produces the most sound. However, time is a very important factor when addressing the acoustic nature of this space. Rev. Laura Engelken likes to keep the space quite plain looking so the people inside it can transform it, whether physically, vocally, emotionally, etc. Therefore, based on the events happening inside, it will look or sound a certain way. During Dinner and Dialogue, a series put on by the Interfaith Center in the Gathering Hall, community’s members are invited to talk about different aspects of society like respect, openness, justice, integrity, responsibility and innovation. In this space and time, conversation is at the for front of noise. Although, we can also look at is as background noise, or chatter. In this situation, as I gathered from Laura’s insight, there are not many keynotes sounds only with the exception of a loud voice here and there. I could not gather any sound files of this occasion in the Gathering Hall, yet from the information provided by students and faculty that spend much of their time in this space, I gathered that this is the case. This dialogue, yet, does not necessary reflect religious noise. It is up to the discretion of the people occupying the room to shape the sound into whatever they want it to be, whether religious or secular. This space is shaped temporally and by the people that take up its barren space. In one instant, it will be filled with people and buzzing with the vocals of students, yet when it is not being used, it can also be seen as a place of solitude and silence. 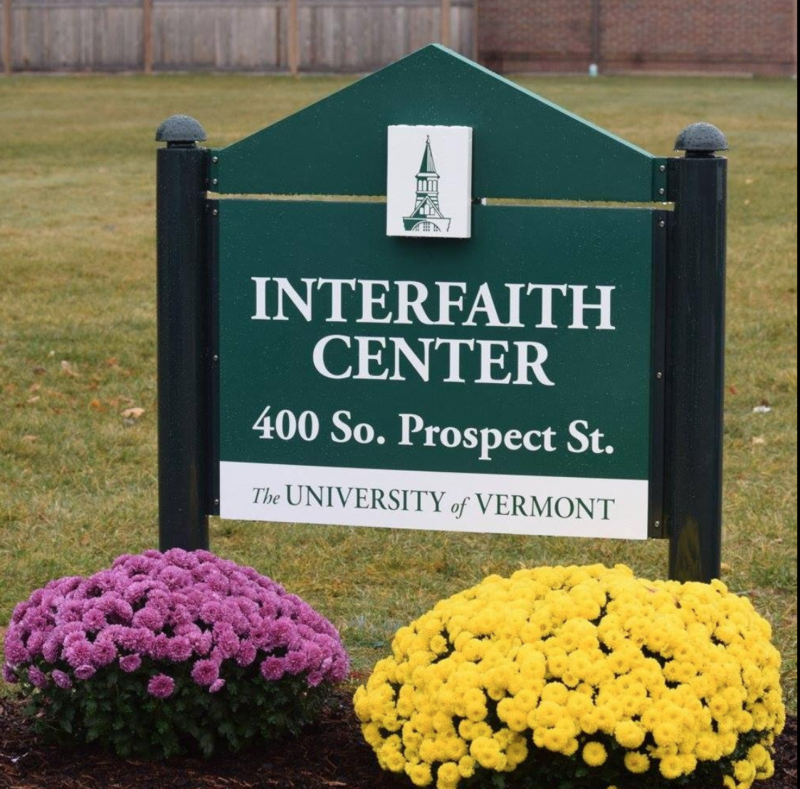 This dichotomy is something that distinguishes the UVM Interfaith space as both religious and areligious, reflective and expressive, and communal and individual. All three of these spaces that function in a unique way make up the broader soundscape of the Interfaith Center. Much like the people that use the space, the sounds that shape it are collaborative. From events like bible studies involving singing and instrumentation to independent meditation, each sound has its own place in shaping the Interfaith Center as a place for urban religion. Robert Orsi’s “Introduction: Crossing the City Lines” helps us define urban religion as something beyond religious beliefs and practices that happen to take place in cities (Orsi, 1999). Instead, practices of religion in urban settings are dynamic engagements of traditions with specific features of the industrial and post-industrial cityscapes and with the social conditions of city life (Orsi, 1999.) In Burlington, specifically at the UVM Interfaith Center, urban religion is constructed in that vary way through sound. The sharing of dynamic knowledge of values, beliefs, and practices through overlapping of religious sound creates the space for changing social, cultural and intellectual contexts. For the Interfaith community at UVM, this is key in bringing religious exploration and meaning making to Vermont, the statistically most areligious state. The construction of an urban religious environment, and religious environments in general are noted by some key elements. One is that the environment and us, the people occupying space, are one. Our ideas about the world are shaped and changed through our experiences in a particular environment. These experiences encompass all of our senses, but in this research, I am looking at how sound socially constructs the space, but also acts in a acoustemologic way. Silence falls into the realm of sound construction and acoustemology. Furthermore, Schwartz recognizes that there is a downfall to saving silence as something for the world of the spirit (Schwartz, 11). It further separates the dichotomy that is the noisy secular world and the quiet spiritual world. At the Interfaith Center, this dualistic nature of sound is apparent, yet is reflected by the people that occupy the space. Here, I think the Interfaith Center “retrieve(s) silence from the world of the spirit and make it part and parcel of what our day-to-day worlds need to be about” (Schwartz, 12). The sounds of the secular, like study groups and small talk, are interlaced with the feeling of silence and the reverent bodies of the spiritual world. The soundscape composition is a display of this intermittent sound and silence. It aims at bringing awareness to the versatility at the Interfaith Center, involving many different religious groups, practices, and events, but also the general buzz of a campus building. Rev. Laura Engelken takes a vital role in my piece because she lays down the foundation for the design of the space. She works me through the thought process behind making each rooms accessible and spatiality of each. Schwartz calls for us, as communities, to work more consciously to design our soundscape (Schwartz, 12). Rev. Laura Engelken’s attention to design in making the Interfaith Center a safe space for both religious expression and student activity is highlighted in our conversation and the physical layout of the space, as you will see in the pictures. For students and visitors of the Interfaith Center, the soundscape is their identity when they are in the space. Whether they are part of RUF and are singing the world of God, or are using the new ablution station in which entails the sounds of running water, the people in the space are the cultural, social, and religious identity of the space. Without the community, the space would be a flat sonic ethnography. However, with all that happens in the space, it creates this dynamic symphony of “loud and the whispered, the shrill and the mild, the startling and the reassuring” (Schwartz, 12). The community is the space. The community is the sound. The community is the experience of both space and sound. American Urban Landscape, 1-78. Bloomington, IN: Indiana University Press, 1999. Responsibility of the World’s Religions, August 1995, 1-13. 33-44. Duke University Press, 2015. “Interfaith Center.” Making Connections. 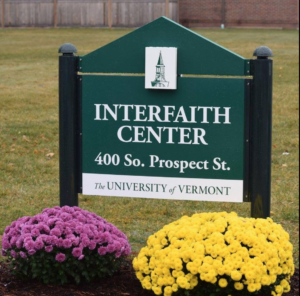 https://www.uvm.edu/interfaithcenter.